CLUCK COMMITMENT CLUCK COMMITMENT Families who have kept chickens say they keep yards free of insects at the same time they provide high-quality eggs for consumption. Bogdan Carstina | Dreamstime.com MEMBERS OF A COMMUNITY ORGANIZATION WANT TO WORK WITH SARASOTA COUNTY TO MAKE CHICKEN-KEEPING LEGAL By Rachel Brown Hackney Editor Members of CLUCK (Citizens Lobbying for Chicken Keeping) are not giving up on per- suading the Sarasota County Commission to make chicken-keeping legal in the unincorpo- rated parts of the county, Jono Miller, one of CLUCK's founders, told The Sarasota News Leader this week. However, Miller said he and other members of the organization are frustrated that the com- mission on Sept. 25 did not provide direction to staff to assist CLUCK in preparing some- thing to take to neighborhoods and homeown- ers associations. During their Sept. 25 regular meeting, the County Commission heard six members of the public — two of whom had brought children with them — request the board to change the county's zoning code to make it legal for fam- ilies to own chickens. 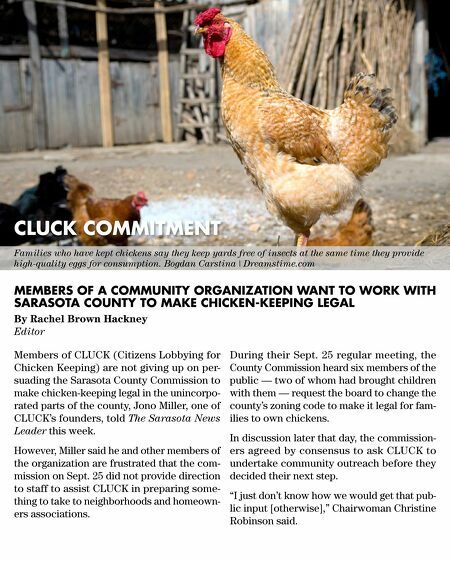 In discussion later that day, the commission- ers agreed by consensus to ask CLUCK to undertake community outreach before they decided their next step. "I just don't know how we would get that pub- lic input [otherwise]," Chairwoman Christine Robinson said.